The Mac Factor Blog: Tactical Tuesday...on Thursday? I want to start a weekly post on Tuesdays called "Tactical Tuesday" where I talk a little about tips to improve your shooting or weapon manipulations. Unfortunately, this past Tuesday ended up being hectic and I never got around to posting. So without further delay, here is the first installment. If you're running a red dot or other quick-acquisition optic on your AR-15 rifle, chances are you have a set of back-up iron sights on as well. Well, you should, and if you don't currently, why not? Batteries die and optics sometimes fail. Hence, the "back-up" sight. Backup sights come in many varieties, fixed, flip-down, offset at 45 degrees, carry handle, etc. But for today we are going to talk about a backup sight that sits on the flat-top picatinny rail behind your red dot. Co-witnessing is a term thrown around a lot on the internet and sometimes misconstrued. Co-witnessing of sights in it's simplest form means having the ability to align your iron sights through your optic with your red dot and have both be zeroed for the same point of impact. This is an extremely important concept to grasp, because it can be a useful strategy to employ when initially zeroing sights or if one or the other has become out of alignment during a fight. Aligning the Red Dot on the top of the Front Sight Post when looking through the rear sight will get you a decent zero on the sight you are attempting to re-zero. It won't be perfect, and will need to be confirmed, but in an emergency it will get you hits. I prefer the lower 1/3 because I like my Aimpoint reticle to be more open and less obscured by the FSP (I use a standard F-marked FSP on my rifles). When peeping through the rear back-up sight, the Red Dot should be aligned with the top of the front iron sight and in the lower 1/3 of the glass circle. When looking only through the red dot, the FSP will be down in the lower 1/3 of view and usually out of view (your brain has a way of "ignoring" it, especially if you shoot with both eyes open, as you should be doing). I cover the utility of this concept in THIS VIDEO, but in short, this is an invaluable concept if you want to zero either a back up sight or a red dot sight in a short amount of time while consuming the minimal amount of ammunition. If you have *EITHER* your red dot or your back up iron sight zeroed already, then you can add the other sight to the rifle and align the red dot with the top of the front sight post WITHOUT EVER FIRING A SHOT! You can do this at home before you go to the range. This will give you a rough co-witness for your sights and will allow your very first shot to be within at least 10-12 inches of your point of aim (depending on how well you get the red dot aligned initially). From there, you can fine tune the zero until both sights have the same point of impact. Now don't misunderstand me, this is NOT a substitute for zeroing each sight individually and accurately. It is simply a time-saver and ammo-saver. And a good concept to understand if you are unfortunate enough to be in a fight for your life and have a sight get knocked loose. 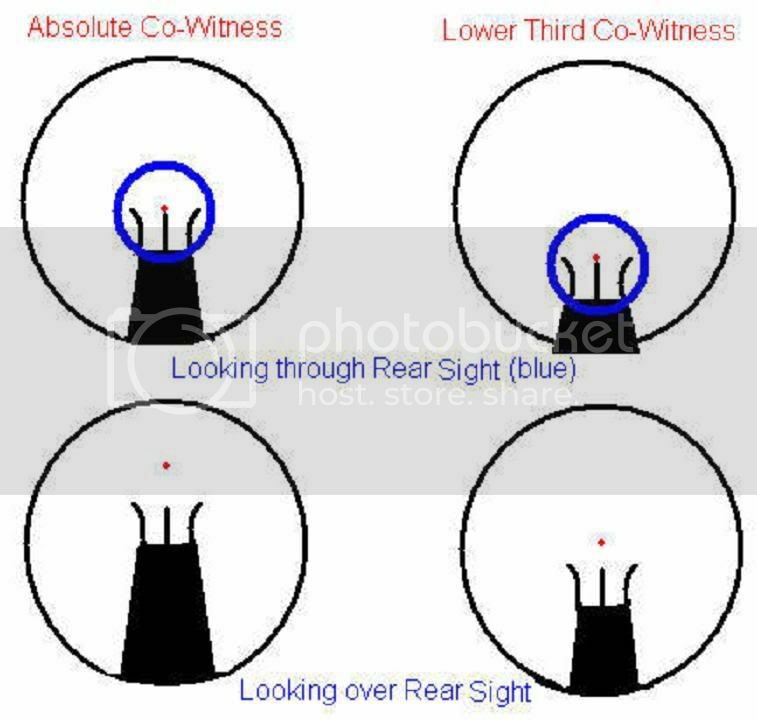 Hopefully this will help clear up some confusion about co-witnessing of irons and red dot optics. For an example of how this is helpful in reality, check out that video I linked above.